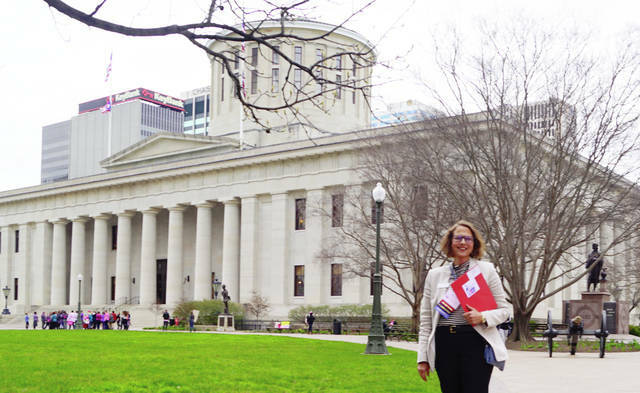 Julie Turner, ACS CAN Ohio state lead ambassador, is pictured in front of the state capitol building in Columbus this week. COLUMBUS – Nearly 100 cancer patients, survivors and caregivers from across the state traveled to the state capitol in Columbus this week to meet with Ohio’s lawmakers about the need to properly fund the state’s Tobacco Use Cessation and Prevention Program, raise the age of sale for all tobacco products (including e-cigarettes) to 21 and provide access to care through the state’s Breast and Cervical Cancer Project. This year, an estimated 67,150 people in Ohio will be diagnosed with cancer and nearly 25,440 in the state are expected to die from the devastating disease. Those gathered at the Capitol called on Ohio lawmakers to change this by taking steps to make the fight against cancer a priority. The visit is part of the annual American Cancer Society Cancer Action Network (ACS CAN) Cancer Action Day event. Discuss amendments to Gov. DeWine’s proposal to raise the age of sale for tobacco in Ohio from 18 to 21 that are needed in order for ACS CAN to support the initiative. Necessary changes include measures for strong enforcement and that won’t penalize youth, which must be made for the policy to have a true health impact. Nationally, 95% of adults who smoke start before they turn 21. Restricting youth and young adult access to tobacco products promises to be a critical component to reducing initiation and a lifelong addiction. ACS CAN supports legislation that will best protect youth when raising the minimum age of sale to 21 and calls on the legislature to amend the proposal to effectively accomplish this critical goal. Support Gov. Mike DeWine’s proposed increase in funding for Ohio’s Breast and Cervical Cancer Project. This program provides vital cancer screenings, such as mammograms, to low-income, uninsured women in Ohio. About ACS CAN: ACS CAN, the nonprofit, nonpartisan advocacy affiliate of the American Cancer Society, supports evidence-based policy and legislative solutions designed to eliminate cancer as a major health problem. ACS CAN works to encourage elected officials and candidates to make cancer a top national priority. ACS CAN gives ordinary people extraordinary power to fight cancer with the training and tools they need to make their voices heard. For more information, visit acscan.org.